It’s time for some bloggy friends and I to share some simple summer side dishes with you. So far we’ve had some Beautiful Tomato & Basil Bruschetta and Refreshing Melon Citrus Salad. Up this week is Mary from Bare Feet in the Kitchen. I love the name of her blog. I have to admit, there is no way I’m going bare foot in my kitchen. At any given moment you could step on a crayon or a grape (yuck!). Be careful by my fridge ’cause you might slip on a melted ice cube! 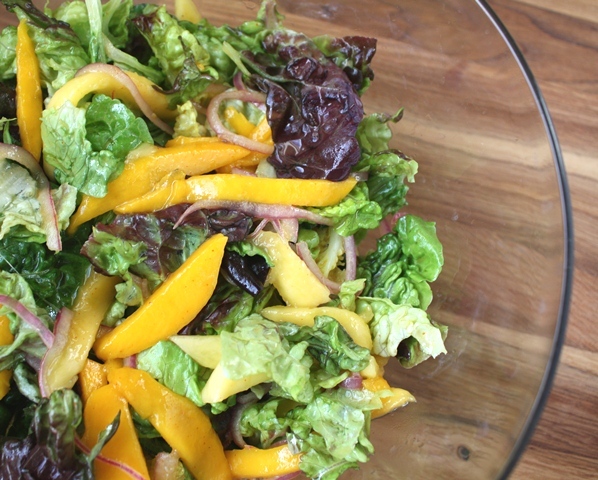 This week Mary is sharing this Mango Summer Salad. In the summertime especially, I’m a huge fan of fresh fruit in our salads. Whether it’s a Strawberry Spinach Salad, Spring Salad with Poppyseed Dressing, Red Wine and Honey Salad with Fruit, or Cashew Chicken Salad with Grapes, there is often fruit in our salads or in the dressings. Since I’m not a huge dressing fan, I must have friut in my salad. I have a mango sitting in my fridge. I may have to have this salad for lunch today! Stay tuned next week for the final simple sides recipe brought to you by yours truly! I love your blog! I can’t get enough!!!! I tried to leave a comment on your blog but it doesn’t like me. You may want to allow anonymous people or something. Thanks so much for the shout out! I love what you did with the skewers. I have pinned it to try later.